Amidst the routine flight announcement as I fastened my seat belt, I took a close look outside the window. I knew I was going to miss Bangalore for the next ten days, however, the excitement of going home after almost two long years overpowered it. Flying for about three hours continuously, I finally reached Lokpriya Gopinath Bordoloi international airport, Guwahati. The air was balmy with a tinge of ambrosial fragrance, the chirping of Keteki (the hawk-cuckoo that denotes the onset of spring) and the lush green fields all vibrant after the night shower mesmerized my heart while being driven to my home. I loved the way the air was giving a gentle touch to my cheeks and the little rain drops splashing all across my face. 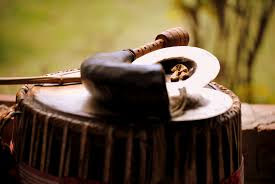 This marked the arrival of musical spring and celebration of Rongali Bihu. 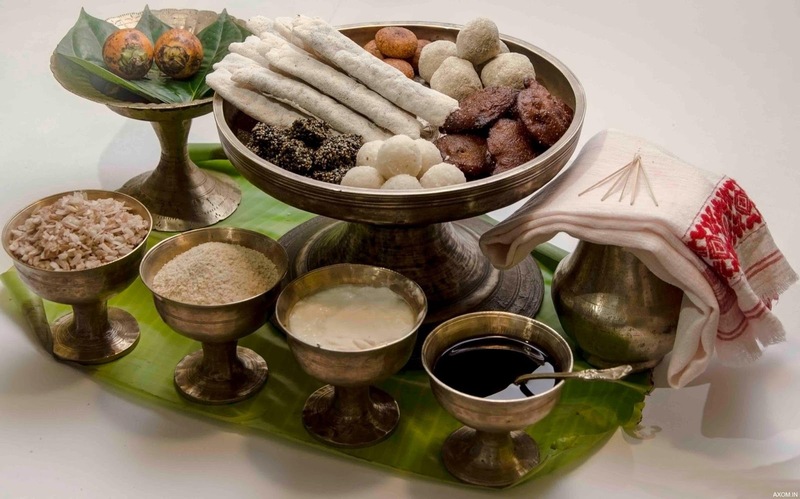 Rongali Bihu is the festival of love, happiness and new beginning. It is basically a three day festival and is celebrated in the month of April. It denotes the heart and soul of Assamese Culture. “Otikoi Senehor Mugare Mekhela, Otikoi Senehor Maku – Tatukoi Senehor Rangali Bihuti Napaati Kenekoi Thaku”. The word Bihu is derived from the language of Dimasa; “Bi” means to “ask” and “Shu” means “peace”. To accommodate the lingual preferences, the word gradually got transferred to Bihu. Out of the three Bihu viz, Magh Bihu or Bhogali Bihu, Rongali Bihu or Bohag Bihu and Kati or Kangali Bihu; Rongali Bihu is the most popular one as it celebrates the onset of Assamese New Year. My mind grew nostalgic as I threw myself back into the colours of this festival. Before the spring approaches, I had been practising hard for my Bihu performances. It is my special way blending into my own culture. My brother had been practising hard for sports which also had vital importance on that auspicious day. We all were getting ready to showcase our talent on the big day. Back in my childhood days, on the first day of Rongali Bihu, commonly known as “Goru (Cow) Bihu”, my Grandfather and his friends used to take the cattle for a ceremonial bath to the nearby pond. They used to clean the horns and heads of the cows by rubbing with Mah-Haladi (a paste of turmeric and black gram) and finally used to worship by offering flowers and coconut. My Grandfather used to set free the livestock, tied them with new ropes and offered cakes as thanksgiving in the evening. The evening used to be totally mine as I used to spent time playing with my brother and Grandfather but the smell of jaggery and coconut used to tempt me to kitchen where my Grand mom along with my mom and neighbours would be busy in preparing delicacies for the next day. I somehow “managed” to have one. I will be eagerly waiting for the second day which is known“Manuh(People)Bihu”. Early morning, my mom used to rub Mah-Haladi on my face and body and my brother would be waiting for his turn. We used to beat a competition for taking bath and as always my brother would win. My mother used to keep a sparkling new dress for me and for my brother. All my paternal and maternal relatives used to visit our house. The young used to take the blessings of the elders. It was so much fun meeting my cousins, nephews and nieces. My mom and dad used to welcome every guest with “Gamosa” (a traditionally woven towel). 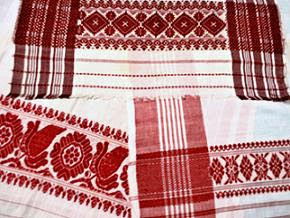 Gamosa or Bihuwan is woven by women weavers. Traditionally, every Assamese house has a woman weaver. 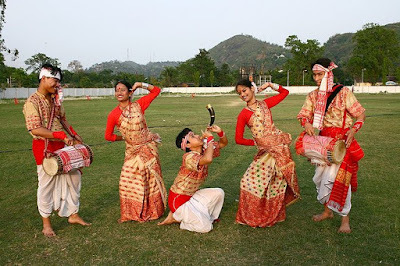 “Gamosa” is the unique identifier of Assamese culture. It is basically a rectangular cloth coloured in white and red. The red motifs which form the border are very traditional and authentic mostly inspired by nature and surroundings. “Gamosa” is primarily use to wipe out one’s body or face however, its use is not restricted to this. It has got multipurpose use by a farmer as a waistcloth, a Bihu dancer wraps it around his head, can be hung around the neck at the prayer hall or it can be a status symbol by flaunt it over one’s shoulder. The weavers complete weaving before the festival arrives and they do a good business by selling “Gamosas” and other traditional items this festive season. I used to enjoy the Til (Sesame) and Narikol (Coconut) Pithas that my paternal Grandmother used to prepare to satisfy my soul. But my maternal Grandmother’s Pithas were the best, they still are. I used to lick my spoon while having her coconut kheer with peanut and raisin toppings. performances. Mekhla can be of various silk, it can be of muga silk, white Pat and Eri Silk. Mugar Mekhla is of golden colour with red floral designs which are weaved by women weavers using the looms. Almost every house has a basic loom which provides a way for the weavers to earn their livelihood. I was clad onto the beautiful traditional Mekhla Sador and my mom gave a final touch by decorating my bun with the colourful kopou (orchid) flowers. My face used to dazzle with the Red “Bindi” between my brows. My performance was followed by troupes of musicians and dancers from different parts of Northeast and the function extended till late night. Early morning, our family used to be busy in cleaning the idols of gods and goddesses. This day was celebrated as “Gokhai (God) Bihu”. Each and everyone will thank for the previous year and pray for a prosperous New Year. …My cab driver gently applied the brakes and I opened my eyelids with little difficulty and saw my family waiting at the entrance for my arrival. Wow, What a sight! My brother’s eyes twinkled on my arrival. I was overwhelmed to meet them after years. The melodious beats of Dhol and sound of Pepa unfurl in the air giving me goose bumps, the sight of the beautiful woven gamosas send a tingling up my spine.. and that’s when I knew that Rongali Bihu was indeed here!